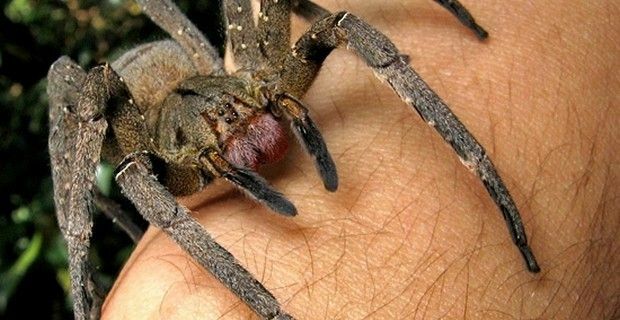 If you suffer from arachnophobia - fear of spiders – or just on principle detest those eight legged critters, this story will not only make you shudder and your skin crawl and you may also decide to forego eating bananas for the rest of your life. The story starts with a woman buying bananas and ends up with her being forced out of her home together with her family after deadly South American spiders began hatching from the bananas. Consi Taylor, had purchased Colombian Fairtrade bananas at a Sainsbury’s supermarket and when she started eating one she saw some odd looking white spots that looked like mold (which is already pretty gross in itself). Looking more closely she discovering dozens of spiders crawling over the skin. ‘I had a closer look and was horrified to see they were spiders. They were hatching out on the table, scurrying around on my carpet. I was so scared I started crying,’ Consi told The Sun. The 29-year-old mother of two, took the rest of the bananas back to the supermarket and was initially offered a £10 voucher to make up for her troubles, but that unfortunately wasn’t the end of the creepy crawly story. Consi decided to send a picture of the spiders to a pest control company, and was told that she and her family would have to evacuate their home as it could be infested with venomous Brazilian Wandering spiders. The Brazilian Wandering spiders scientific name is Phoneutria nigriventer, but they are more commonly known as the "banana spider" and are indigenous to South America and parts of Central America such as Costa Rica. The banana spider is considered to be the most venomous spider in the world because their bite contains a neurotoxin can cause the loss of muscle control, breathing problems, paralysis and eventual asphyxiation. In 2008, a worker at the Tesco store in Chatham, Kent found an adult one under a box of bananas, which was later captured by RSPCA officers.